Join Metatron for our debut discussion series. 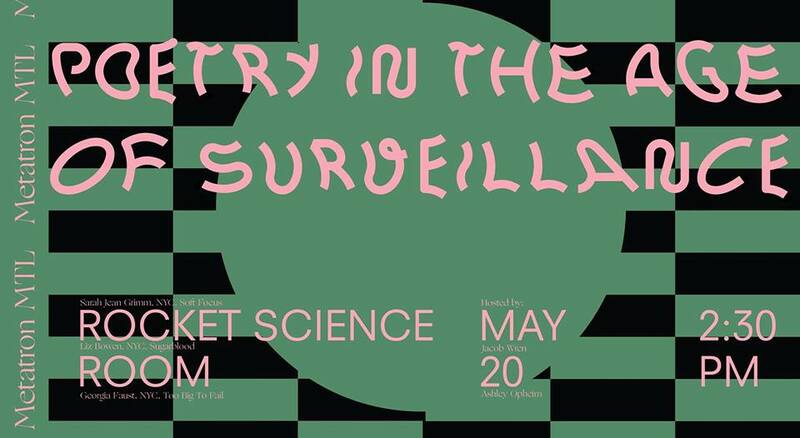 The theme for our inaugural edition is ‘Surveillance’ at the Rocket Science Room. ‘Poetry in the Age of Surveillance’ will include readings from Sarah Jean Grimm (NYC), Liz Bowen (NYC) and Georgia Faust (NYC) and a discussion moderated by Jacob Wren (Families Are Formed Through Copulation, Revenge Fantasies of the Politically Dispossessed, Polyamorous Love Song + Rich and Poor) and Ashley Obscura (I Am Here).